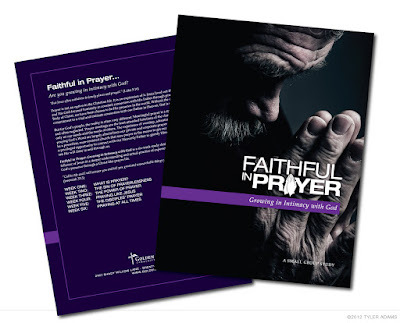 This is my 4th year designing the church-wide campaign devotional book covers for GHCC (see 2011 and 2010) and the books are printed and ready to go. This year's theme, Faithful in Prayer, is focused on learning more about why we pray and how to pray the way Jesus intended. The key image I chose for the cover is of this elderly man in intense prayer. I really liked this image because who the man is could be left open to interpretation. Is he a grandfather? A prophet? A homeless man? A priest? The point is that it does not matter WHO we think he is, but that he is intimately speaking to God. The image is cropped really close on the man's face and hands to try to capture the intimacy of this time the man is having with his Heavenly Father.